Those of you who have been following since 2011 knew this day was coming. In addition to all the fun food finds that I come across, I’ve been planning on documenting some of my more focused meals. The protein shakes are crucial to the workout routine I’ve been following. You may think that protein powder supplements are complete hogwash, and, a walk through your local GNC would probably confirm your suspicions. The shelves are lined with all different powders: weight gain, fat burn, Muscle Milks, and it goes on and on. The truth of the matter is that an everyday person who is doing mild exercise and eating somewhat healthfully doesn’t really need to supplement protein into their diet. Once you start incorporating weight training into your routine, you really need to start thinking about how to get enough protein into your day, because, from the financial perspective, purchasing enough fresh protein to make your training benefit your body will drain your pocket quickly. Of course, there’s always eggs, and eggs should be an important part of your diet as well, but who the hell wants to drink 4 raw eggs to get 25 grams of protein? Me neither. I’m not at a point where I’m doing the shakes every day, but I do have one after every weight lifting session, which is 3-4 times per week. Vanilla and chocolate Isopure are both staples in my diet; I always keep a 3lb tub of each around. There are other flavors, but, to me, vanilla and chocolate are the easiest to doctor up. On their own, they’re fine, but I like to make each shake that I drink a treat. Here comes the local part. 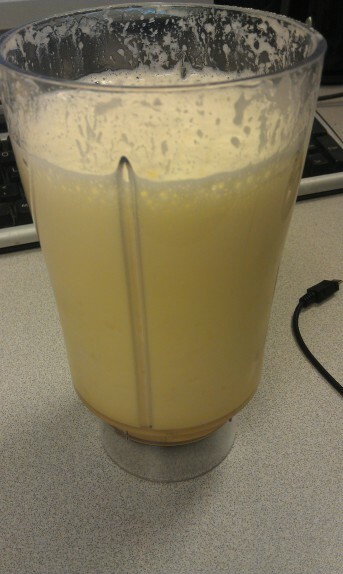 If you’re going to commit to the protein shakes, I’d also recommend making a small investment into a personal blender. The one I use is this model, but any blender will do. You can go old school and just use a blender bottle, but the Orange Julius won’t come out right because that can’t crush ice. 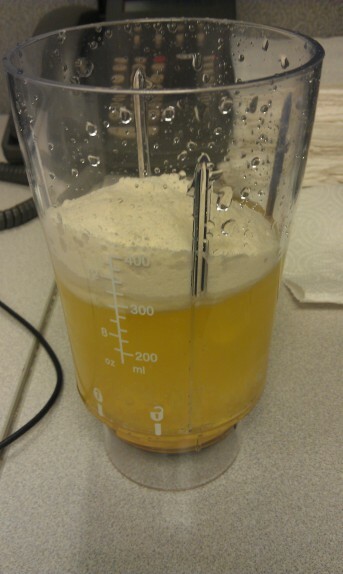 On top of 3 oz of ice, I add about 4 oz of water, half of a packet of orange drink mix (probably the equivalent of half a tablespoon), one scoop of Vanilla Isopure powder, and a tablespoon of the fiber powder (this is optional – I use it to supplement my fiber intake because I don’t eat enough vegetables right now). Then I blend it together slowly in pulses. If you just blend it outright, the powder will stick to the sides and not incorporate, so be patient and pulse the blender. Notice that the volume increased considerably. This drink packs 25 grams of protein in just over 100 calories with almost no carbohydrates. It also has a bunch of vitamins and minerals that will help your body recover from training. I wouldn’t call it an Orange Julius if I didn’t think it tasted like one. I mean, this tastes exactly like what you get in the malls. The bright orange flavor with the creamy vanilla in the background. If you fool around with your ice and water ratio, you can change the consistency. Lately, I’ve been using no ice and have been happy with the result. I have had other vanilla powders that taste better and that taste worse, so I can’t guarantee that a substitution will yield a comparable drink. The same goes for the orange drink mix. But if you start with this, you can add your own touches. If you like Tang, add Tang. I don’t care. Actually, I do care. Let me know what you do and how it works for you. I’m constantly looking for ideas of things to do with my protein shakes. I love Netrition…they were a client of one of my former employer’s. The owners are really nice and really passionate, it’s a great family business. 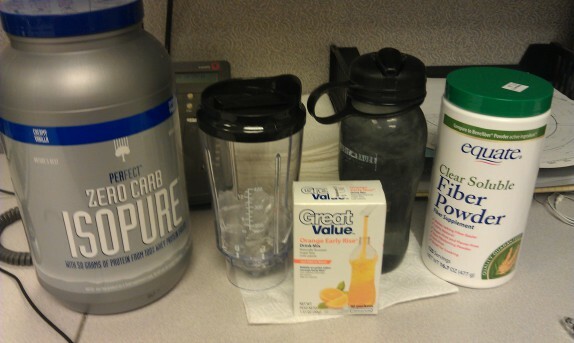 So do you use the shakes a supplement or a meal replacement? Are they filling enough for a meal replacement? Do you feel like a protein supplement really makes a difference in your weight training? At only 100 calories all from just protein, there’s no way I can consider it a meal replacement. Also, because I take it right after working out, I get hungry within about 60-90 minutes usually. So it’s strictly supplemental within my diet. I was wondering if you have looked into the body by vi 90 Day Challenge? Our special Protein shakes taste great by themselves and there are several recipes to change them up in healthy ways. They are very filling and if your still feeling hungry you can add a 3rd scoop of Vi shake and may want to try Vi trim our clear hunger control powder. Body By Vi also has products for energy. We have 3 different energy drinks. Keep in mind all of your products are natural. Take a look at my site and see what you think. Thanks and good luck to you.